Schools from in and around London have used over 16000 lemons, 8000 oranges and 7000 limes in a day of frenzied lemonade selling that would rival The Apprentice as part of international Citrus Saturday. Citrus Saturday - an initiative set up by UCL to show young people what it's like being an entrepreneur - saw 150 eager teens from more than 30 schools and youth groups across London, including South Camden Community School, the Bethnal Green Academy, Streatham and Clapham High School and Westminster Academy set up 28 lemonade stands across London, from Euston to Lewisham Shopping Centre. The teams were supervised by a group of staff and students from UCL, as well as six New Entrepreneurs Foundation Fellows, who as well as supervising on Citrus Saturday also volunteered their time for a series of workshops before the day , teaching the teams everything from basic business management to food hygiene. Each team ran their stall as closely to that of a small business as possible, having been provided with seed funding from UCL to buy fruit and materials for the day. After frenzied selling on Citrus Saturday itself, the participants were allowed to keep their profits. The stands across London were generously provided by partners including Boxpark Shoreditch, Land Securities, Euston and Paddington Stations, Sainsbury's and Waitrose. The initiative is the brainchild of Timothy Barnes - the Director of UCL Advances - after he travelled to a business conference in the US and hearing of a similar approach being pioneered there to encourage young people to aspire to set up their own businesses. The programme was established with joint-funding fromUCL and an EU Interreg 4b grant for northwest Europe. Citrus Saturday seeks to emulate that approach through a fun, absorbing and - most importantly for the teenagers taking part - financially rewarding day of setting up a lemonade stand. The initiative is now in its fourth year and, for the first time, saw young people across the UK and in Mozambique, Spain, France, Germany, Belgium, Ireland, Swaziland and Greece all participating in Citrus Saturday on the same day - the first Saturday in July. "This is the most popular Citrus Saturday ever, with more schools and more young people taking part than ever before. 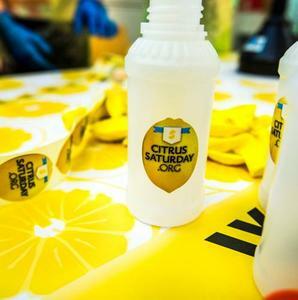 "The popularity of Citrus Saturday really comes from the kids taking part taking the responsibility from the very beginning for all aspects of their business - what kind of lemonade to sell, how to market it and which pitch they want. "It's completely immersive and fantastic in giving them a real taste of what running a business is like." "We're delighted to support this excellent UCL initiative. The concept of getting children to think about entrepreneurship by actually building a business in a day - in this case a lemonade stand, is a great way to show them the many aspects of starting a business. It's hard work but done in a fun and engaging way. "Our NEF Fellows who are participating and sharing their skills and knowledge have enjoyed it immensely. We plan to make this sort of outreach work a mandatory part of the NEF learning programme as our Fellows also learn from the process. We hope to become regular participants in the Citrus Saturday programme as it grows."